In Utah, mulch has many purposes in the garden and landscape. You can think of mulch like your own personal helper around the garden, because it makes many of the most mundane and time-consuming tasks easier. Unfortunately, many handy homeowners don’t realize how much this all-purpose landscaping material can really do. What Can Mulch Do for You? One of the most beneficial features of mulch is its ability to hold precious moisture in the soil. By reducing evaporation, this landscape material helps you reduce water use significantly. And, when you do water, it facilitates more efficient use and absorption into the soil below. All kinds of mulch help preserve nutrients in the soil. Organic products enhance the soil makeup in your garden and landscaping, keeping it rich and viable year after year. Mulch works wonders for your plants by protecting their roots from temperature extremes and discouraging pests and weeds. When you use a mulch product in your garden, you will significantly improve its appearance. You’ll also need to pull weeds less often and you won’t have to use as much (if any) harmful weed killers or pest control chemicals. 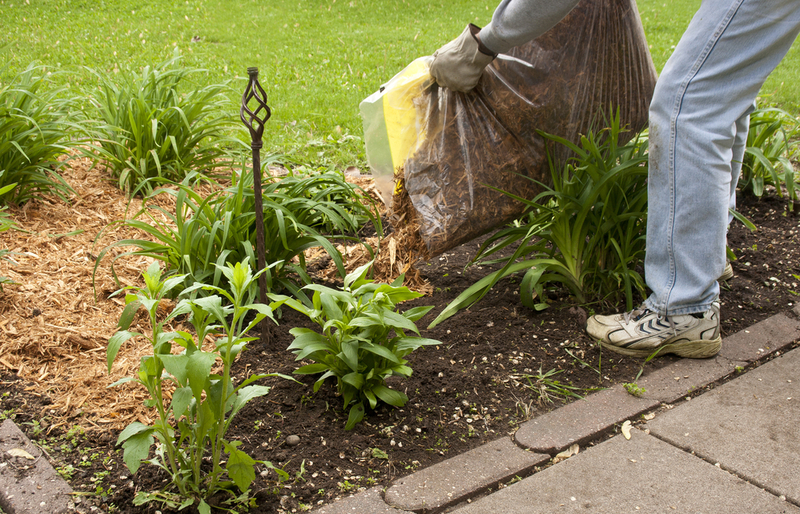 What Kind of Mulch Should You Use? Organic mulch consists of partially composted wood – typically shredded bark. Natural bark mulch has no dyes or coloring, but you can also choose dark brown mulch or black mulch. You can also purchase a “fresh” version of this product, although it will not contribute to soil improvement. You can also use cobble or gravel as mulch. Obviously stone won’t break down to improve the soil but it will improve the appearance of landscaping areas, discourage weed growth and help prevent soil erosion. And, of course, gravel will also hold in that all-important soil moisture. How Can You Use Mulch in Your Landscaping? Apply mulch as a uniform groundcover throughout planting beds, around trees and in landscaping areas and gardens. Use a layer of at least three to four inches in thickness; apply it too thinly and you won’t get all the benefits. If you’re mulching hillsides or areas prone to erosion, use a six-inch layer to ensure it stays put. Leave a four to six-inch gap around tree trunks, shrubs and landscape plants with woody stems, to ensure proper air circulation. Most folks add another layer about once a year; however, you can always add more whenever it looks like yours is breaking down or washing away. The smaller the size of the landscape materials, the faster it will break down into the soil. For areas that are especially damp naturally, organic products may hold in too much moisture. And, for those locations that bake in the sun all summer, rock or other inorganic products can retain heat that may damage your plants. Otherwise, you can use your favorite landscape material anywhere your heart desires. The Dirt Bag provides landscape materials delivery throughout Northern Utah. If you need topsoil, garden soil, play sand, gravel or organic mulch, give us a call today to place your order.